Where the Railway Path runs into all the schoolkids crossing to whitehall, there's now a sign up: Thank you for not driving. It is more than just a recognition of the fact that so many of the people on the path are doing just that, it is a way of remembering Pete Taylor, who was the man behind the signs. We will meet at the Kebele centre at 9.30-10 on Sat 18th July. For those of you that don’t know it, you can get directions at the website - . It is hoped that a few people will bring some cakes, and we can have a coffee and nibble whilst we all gather. Pete loved cake so this seemed to be a fitting start to proceedings!! Let me know if you are up for bringing cake contribution! We will then amble down the cycle path to the Oak trees Pete planted where we will scatter his ashes and remember him. Everyone is welcome and people are invited to share their memories and celebrate his achievements in any way they see fit – music, talk, poems, songs – whatever! I’d really appreciate it if people could spread the word via word of mouth, and please also forward this email to anyone I’ve forgotten to send it to. Many thanks and I look forward to meeting as many of you as possible on the 18th. For those of you who don't know the full story, there's a two page article in this summer's Bristol Cycling Campaign magazine. Pete used to find acorns, germinate them and nurture the seedlings until they were ready to be planted, which he then did. The oaks growing along the path are his work, and they will outlive all of us. Saturday Evening on "The Strip"
James Barlow observes that while he was having dinner, the BBC were using his license fees to film in a restaurant off whiteladies road. What he doesn't mention is that on the street outside, people were running around and outside the running shoe shop, stopping to play a game involve floating toys in a paddling pool. Each person wearing the adventure-racer rucksack has paid £30 to take part in this two day event, which hopefully involved other kids games, including a trampoline. Always interesting to see what notes get stuck on car windscreens. This car is parked legally, not blocking any junction or driveway, isn't even within 50' of a junction, that being a parking law that doesn't exist in Bristol or any other UK city. Ever. Perfect punctuation, capital lettered. Someone spent time on this. 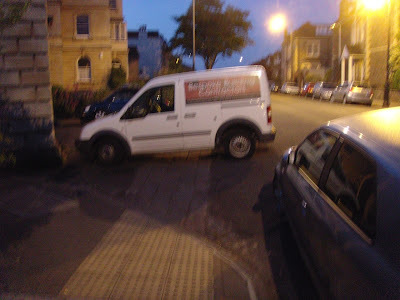 The problem is, parking on a road where it is legal to do so, not blocking driveways etc is in fact technically legal. So there isn't much you can do about it. There's also the question of what the resident families were planning on doing with their cars -they weren't trying to go to another part of town themselves, park in front of someone else's house, do a school dropoff or similar -where they? It would seem equally legitimate for this commuter to go round putting notes on everyone's doors complaining that the resident families make it impossible for commuters to park. And for both the resident families and the commuters to put notes under the windscreen of every car owned by a resident that doesn't get used for commuting or school runs, but instead sits there while the parent -selfishly- doesn't drive to school or work. It is those people, the so-called environmentally friendly cyclists, who are the worst. Not only do they slow cars down on the road, by leaving their cars in the street, they are the ones denying the rest of the city parking spaces! 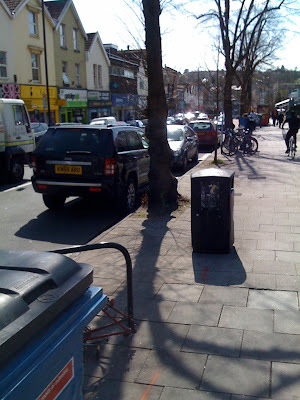 Cotham Road. 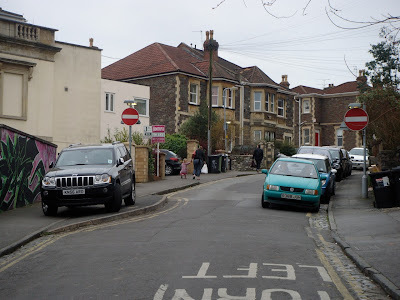 With the school building going on, the trees are missing, its more hazardous to cycle along, but at least the builders are trying to retain safe access for schoolkids from Cotham Grammar to their coaches, by providing somewhere for the coaches to park. They have sign telling you not to park there. Today, Bristol Parking Services are out to make sure that the sign is obeyed. That's their car behind the Renault, WP51XXU. Two parking officers, talking to a mum. 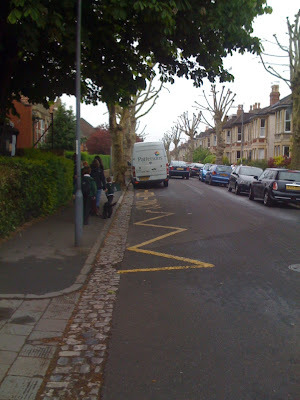 Not a Cotham Grammar School mum: one from Steiner School across the road. According to the web site, their slogan is "Where education is a journey, not a race". True, but there is always the parking at the far end. 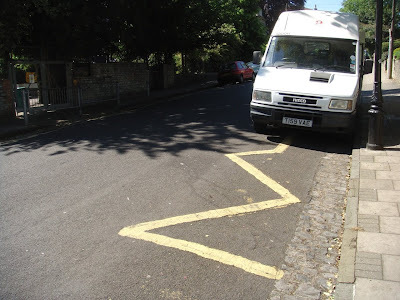 Today, the topic of Steiner School discussion is this: is it acceptable for a parent dropping off their child to stop coaches parking, hence endanger other schoolkids? Alternatively: is it acceptable for the BPS staff to endanger children being dropped off, by stopping them parking? As you can see from the video, the officers are being given a fairly hard time, and yet taking it quite well. In the background, one of the officers is saying that this is nothing, if you want to see a road where they get a hard time, go to Guthrie Road. Oh yes -been there. Another cyclist, dangerously using the phone while towing a child from school. He has pulled over, but given this is the top of Cotham Brow, that's a very wise move. But it is still dangerous. Why? That child is getting bored. Another couple of minutes of parental chat and then dad's going to set off down the brow at speed, curve round the mini roundabout at the bottom and only on the level bit will he notice the lack of pedalling coming from the stoker. At which point, it's back up that hill to try and find the kid that got bored and ran off earlier. Some people say this isn't going to happen, but those people haven't been half way down Burrington Coombe when they discover their small child has actually got off by the ice-cream van at the top. Just a wee reminder about the Critical Mass bike ride on Friday! Still a little time to spread the word... and remember to decorate your bike (and/or yourself) in some way if you get chance - anything from a couple of ribbons to a full-on costume would be fantastic! As always we meet at the fountains opposite the Hippodrome from 5.30 and set off at 6pm. Look at these women. They are pushing their children down the middle of some Montpelier roads. First, Upper Cheltenham Place. Some readers may complain that although they are walking down the roads, they are not wearing high-viz clothing, and none of the babies in the push chairs have helmets. But it is worse than that. These mums are actually pushing their children around the city! On foot! They would be much safer driving them in a family-friendly 4x4 vehicle. You would never see mothers this irresponsible in Clifton. 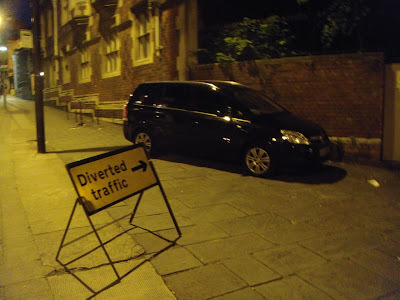 The trouble with diverting traffic, is that there's no way of telling where it will end up. This is a pity for the new residents of this recently sold-off and refurbished Alms House complex in Colston Avenue (which has no parking provision). The lost car may very well be occupying one of their new guerrilla parking spaces. This is obviously a new highways experiment combining street musicians and Bath Ales delivery vehicles to force cyclists into the correct position for getting to Stokes Croft without being flattened by cars turning left into Ashley Road. It worked perfectly. More please. WU58KNA outside Sefton Park school, midday, on a school day. This on the afternoon of the St Werburgh's Fair: someone has graciously put a sofa in their driveway on Nugent Hill. It may seem like a little gesture, but when you are walking up the hill, somewhere to sit is good. There are no council provided seats, so this privately managed resting facility is much appreciated. Some day, every hill in Bristol will have a sofa half way up it. Ever come across a street that hasn't got any cars parked on it? Spooky isn't it. You always get that feeling that it must be for a reason. You double check just to make sure there are no signs around prohibiting you from parking. There aren't and there are no yellow lines either. The street is nice and wide and not near any schools or emergency facilities. But why is no one parked here? When faced with this sort of surreal and perplexing situation it's always best to be sure to park up the pavement just in case. After all it might also be disallowed for you to park in the carpark for the flats that you're visiting 10ft further round the corner. And if a traffic warden does visit while you're inside the flats doing your computer work then at least they'll recognise the now widely accepted parking style that unmistakeably says "It's okay, I'm only here for a minute or two". 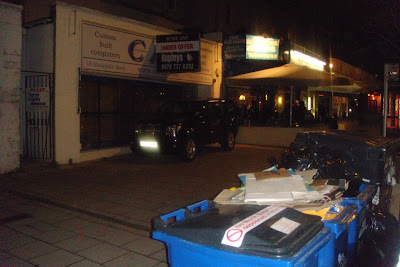 And remember, the further up the pavement you can get, the more seriously the wardens will take your message. Only to be confronted with health and safety warnings and what seemed like millions of pedal-pushing anti-establishment types, cycling around, getting in my way. The warnings were completely justified. What a racket those bands made, especially Smerin's Anti-Social Club. Doctor Who theme tune? Is Nothing Sacred? Here are some building works underway on Grove Road, Redland. It used to be two-way, but this was causing problems at the bottom, so it was made no entry except to bikes, who get their own little entrance. The builders are not blocking the entrance with their skip. 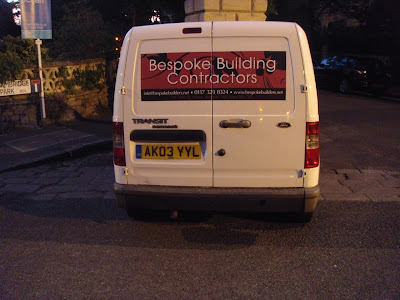 The builders are also not blocking the bike lane with their van. This is inconsiderate and dangerous. Why? Because it creates a blind spot for bikes when they merge with the cars running the no-entry signs, such as WM56ESN, at 3:07 pm on a weekday afternoon. If the bike contraflow was blocked by the skip and van, bicycles would be forced to go through the no-entry signs, and so integrate better with the main flow of illegal traffic. Bristol City Council appear to be re-educating their white van drivers and delivery supply chain. By sending them back to school. They appear to have reserved some parking spaces for them! We'd heard that the police were stopping bikes on the downs, so nipped up to see if the cyclists were being the good beating they deserved before their bikes were confiscated for not paying any tax. Oddly enough, this was not happening. Instead the cyclists seemed happy and the police were even there on their own bicycles. What was going on? At which point a devious idea slid into view. These cyclists are being stopped by people in high-viz clothing, having something stuck into their inner frames, and then fill in some name and address paperwork, before cycling off happily. If you wanted to get the addresses of bicycles you wanted to steal, this is the way to do it. Rather than follow mountain bikers home from Ashton Court -something thost cyclists are aware of and fear- just wave them down, offer them a free id tag -in reality a piece of plastic- and get them to fill in their address on a form. They tell you where they live, you go back later and grab the bike. Now, the next question: how can you determine that this is not exactly what was going on on the Downs, and, apparently, will be repeated on the Biggest Bike Ride event on Sunday? Are these really police, or is it just a big bike theft trick? Only a few days after visiting the Bristol Bike Project, and already we can recognise the signs of one of their donated bikes. It's not the bike itself -there's nothing wrong with having a twenty year old supermarket-grade mountain bike that is still running the original Tioga Farmer John tyres and thumbshifters -retro is back in you know, though ideally with bikes that were actually good in 1991. The real clue is the way the owner treats it. Rather than as an undervalued utility vehicle, the people that those subversives in the Bristol Bicycle Project have been supporting are so poor, so deprived, that this is about their only possession -so they love it and value it more than anyone else. It's that expression of care that gives it away. Instead of leaving it in the manned bike parking area, this bicycle is so precious that the owner brings it with them at all times. The other sign is the general unhealthy appearance of the individual. Not only does he have a strange accent from abroad, his body looks as though it has been neglected over the years, with their legs and arms taking on the pallor of someone unwell. It is the classic suntan of someone from a Glasgow or Edinburgh housing estate, the "Trainspotting Look". This particular individual said that although originally from Wales, he was chased out of his country for his political beliefs (LibDem). He now has to regularly travel to London to seek work. Many local political activists have told me that it is unfair that he should suffer this way, and hope that he will soon have to stop such travel. We in Bristol Traffic have no opinion on the topic, other than to express our concern over the state of his legs. A bit of sunlight will do wonders there. Coming out to the St Werburgh's fair could be the first step in this recovery process. We managed to sneak some photographs of the subversives on the Bristol Bike Project. They aren't giving the bikes away, or selling them. They are making the people who want a bike come down and fix one together -under supervision. Here James is showing Mohammed from Ethiopia how to set up the front derailleur/click-shifter. Nearby, Alfil and Asad are admiring the bike they've just got lights and mudguards on, under Colin's supervision. The students are even learning how to fix punctures. It ensures only people who really want a bicycle get one. It gives the new owner a good feeling of accomplishment. Instead of being pushed around by the state, you are starting to gain some control of their lives. Once you've put in the effort, you will value it more, look after it more. You are now equipped with all the skills needed to keep a bike alive. You may need to borrow the tools from time to time, but you can mostly fend for yourself. You are equipped to maintain other people's bikes too. That's pretty devious, and by the expressions on the refugees' faces, you can see they are looking forward to getting out on the bikes. And that's the problem. Right now: refugees, asylum seekers, Big-Issue vendors. The underpeople of the city, despised by we, the Daily Mail reading majority of the city. A scapegoat-group for all our troubles. But at least they stay out the way. Once they have a bike, they are free to get in the way of us taxpayers, and so become members of a completely different scapegoat-group -the town's cyclists! A group of people more broadly hated in the mainstream press than any asylum speaker would ever otherwise be. They have no idea what they are getting in to. Sometimes we feel this site is the only site that speaks up for Hotwells, the under-valued western end of the harbour. Yet you can see that people travel distances to come and admire the flyovers, with the contrast between the modernist concrete and the Georgian terraces behind. The old railway bridge, with the mud glistening underneath, is a place of peace and quiet to treasure before the BRT developments turn it into another piece of road. And speaking of roads, what is this? An abandoned looking track with rubber surfacing, over the parkland? According to some allotment people, it was put in to get some heavy machinery in, since they left it has been abandoned. Not abandoned -we say it is the tooling needed to finally implement our vision of a new Hotwells: one with a skateboard/BMX park! Bristol can be a bit snobby. Yellow lines, build-outs, pavements. Ye Gods! It wouldn't happen in Clifton. Lot of people chose not to drive to the St W's event, presumably the drink-driving laws getting in the way of sensible travel. Here see a purple milk float with room for six, behind the three person sound-system bike. The front two are in charge of movement, while the one at the back powers the amplifier and manages the ipod-based music collection. He also gets to eat off a plate. We see someone on a fixie, and while we are yet to decide whether this is fashion getting in the way of sensible, a discussion with this rider on their downhill-MTB related knee and leg surgery convinced us that some people do it as it is less dangerous than DH work. His daily commute up Park Street is good for fitness, apparently. That said, he got very wistful when the trenchard street lift was mentioned to him. When will that facility become an official part of a cycling city, we wonder? Nearby, a mix-yourself smoothie system. Finally, a use for small children. Just outside the fenced off area -a large, supervised bike park. This is unusual, as even in years past when the Ashton Court festival was free, there was nothing like this. It will enable many people to cycle to the fair, get drunk, and then ride home. Do I win the Corner Parking Competition? It's 04:00 am, I've just dropped a child at the 'Unnamed Road' on the downs for a week's trip to France with his school. The blurred photo reflects my perception of the world at this time of day. Notice the dimpled paving carefully aligned with the 'faux' pavement that crosses the road. The photos below, however, show why I should win! (I'm not biased, of course). 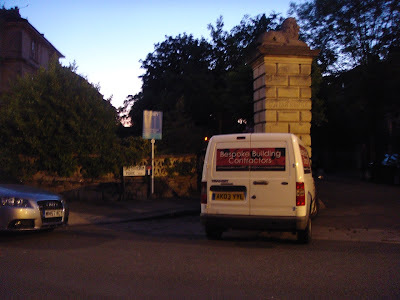 Not only have both the Audi and the 'Bespoke Building Contractors' van - AK03YYL - parked in extreme parking conditions, but they are also performing a real service to all road users by protecting them from the famous lion-topped post of Cambridge Park. Pedestrians suffer slightly, of course - requiring them to make a small detour from the desire-line of the pavement itself, but at 04:00am, that's hardly of real concern for anyone, is it? And your fetish for hi-viz and other gear is odd and by promoting it you are merely stunting the growth of bicycle culture. Where are your photos of pedestrians in hi-viz or your calls for them to wear these things? Good point. We haven't been covering the pedestrians properly. Consider this posting a correction. Interestingly, since we were denounced, traffic to the site, indeed that post has been fairly high. The initial thought was that our philosophy had taken seed across Europe, and soon even in Amsterdam and Copenhagen people would be riding round in hi-viz tops and budget Lidl waterproof trousers. But no, that turns out not to be the reason for the sudden surge visitors. A quick look at the search keywords that bring people to the site shows the real driver. 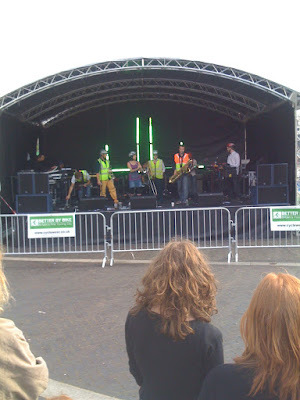 If you type "High-Viz fetish" into your favourite search engine, Bristol Traffic comes out on that first page. Clearly enough people have been doing exactly that, that it's been bringing a whole new audience to the site. We can but welcome these new viewers, with their special interests, and invite to Bristol, where they will blend in, on foor or bike. Those who are about to put on High-Visibility clothing, we salute you! The Farm Pub Path has long linked Muller Road with the village that is St Werbugh's "under the tunnel", a village which, unlike many rural villages, still boasts a decent pub and a thriving agricultural industry, albeit one not considered legal by this nation's drug laws. You've been able to get from Muller Road/Horfield to the pub and back again on foot or by bike -but the one thing you have not been able to do is cross the allotments while travelling in a samba band. This has severely inconvenienced some potential path users, who like to travel in such a format for safety, and for the social aspects of travelling en-samba. This weekend, the offical path opening took place. As you can see from the video, the first testing of a sending a samba band along the path did prove successful, and the path is now open to all marching bands, be they samba, brass or bagpipe. To celebrate the event, many people came out to enjoy the beers and cider on sale by the Farm Pub, the city farm and some local residents, before staggering home. Anti-car subversives -in our own city! Anyone who follows this blog will know that we think pedestrians and schoolkids should be banned, and as for bicycles, well, their owners should be made to pay an annual tax, and even then not allowed to ride their bike on roads or pavements, but only on a small bit of path where a bus runs alongside it, a path where they are required to wear helmets and hi-visibility clothing. As such, we follow the party line of the Association of British Drivers and the Daily Mail, as well as its local sibling paper, the Evening Post. It comes as a shock to discover, then, that none of these prestigious organisations have picked up on a growing scandal in our midst - a small group of subversives who are actively trying to make things worse for car drivers in the city -by giving bicycles to people who cannot afford them! These people, the Bristol Bike Project, are being quite open about it. From their bunker somewhere in Stokes Croft, they are fixing up old bicycles, and giving them away. They are even begging for anyone in the city who has an unused bicycle rusting away to bring it down, to donate it, and they will fix it up or use it for parts to fix up the others. What is most shocking is that people in this city have really been doing this! We can understand why fellow citizens would have a bike rusting away, after all, once you grow up you don't need it, but to give the bikes away, so they can be used? Do these people not realise that by their generosity cars, taxis and buses will be held up, while pedestrians are endangered? We couldn't believe this was true, so snuck down on the pretence of being there to donate some parts -in reality we'd just stolen them from a bike outside, so ensuring there would be at least one less bike in our way today, then while the project team were distracted, we took some photographs with our hidden micro-camera. Look, a whole production line of machines, waiting to be built up and in the way of tax-payers! Apparently they've built up sixty already, to refugees, asylum-seekers, big-issue vendors and other non-tax payers -out there, getting in our way. And there are more on the way. After positive press in some bike site, and Bristol Indymedia, more have been coming in. And not just adult bikes, kid bikes too! So children will be getting in our way! Are these subversives satisfied? No they are not! They are still asking for more bikes! for more spare parts! From tyres to brakes! Adult bikes and kid bikes! This is a scandal -yet the mainstream press haven't picked up on it, not even the socialist papers like the Independent, that will probably praise its goody-goody-ness. It must be stopped. But what to do? The solution is simple. Nobody should even think of donating old bikes or old bike parts to the team down on city road -the team whose email address is thebristolbikeproject at gmail.com. To do that would be madness, it would only encourage more people to get out on their bikes and get the way of decent, tax-paying, daily-mail readers like us. Bristol Traffic is one Year Old!